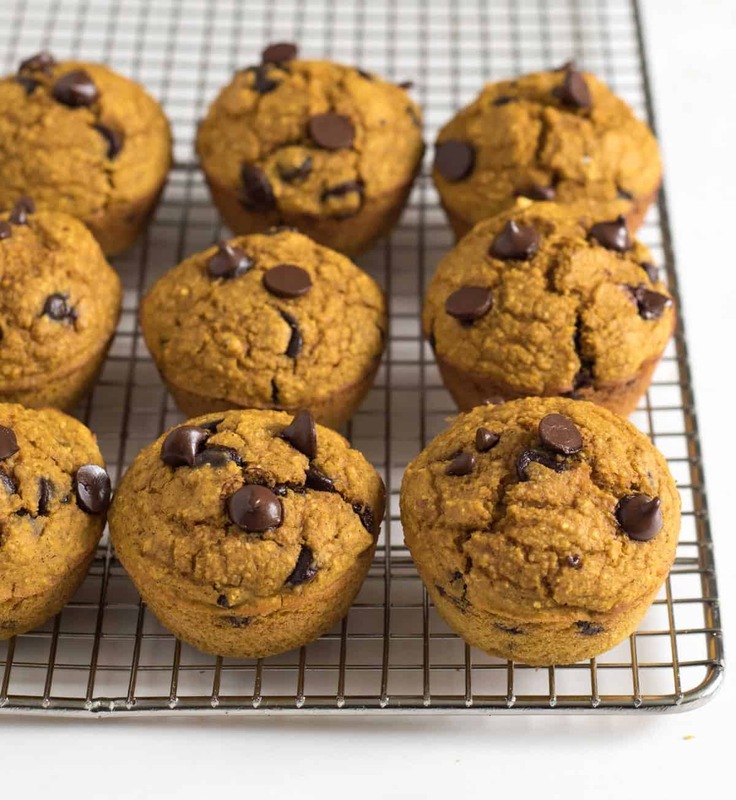 Healthy Pumpkin Blender Muffins are made by placing wholesome ingredients in a blender and processing until smooth. Simply blend, bake, and enjoy! Have you heard of blender muffins yet? They were new to me until this summer when I started making them and now I love love love them! The idea is that you use the blender to do all of the work and you end up with a one “bowl” muffin that tastes great. The perk of using the blender is that you can turn whole grain oats into oat flour and you don’t have to mash ingredients like apples, carrots, bananas, or anything else that might need chopped up or mashed in a muffin ahead of time. Just toss what you need in the blender, and let it do it’s thing. Plus, a blender is really easy to pour that batter out of! 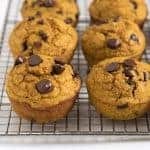 I love this Healthy Pumpkin Blender Muffin recipes because it’s made with whole ingredients like pure maple syrup (and no other sugars), pumpkin, whole grain oats, and other wholesome things I don’t mind my kids eating for breakfast, lunch, and snacks. 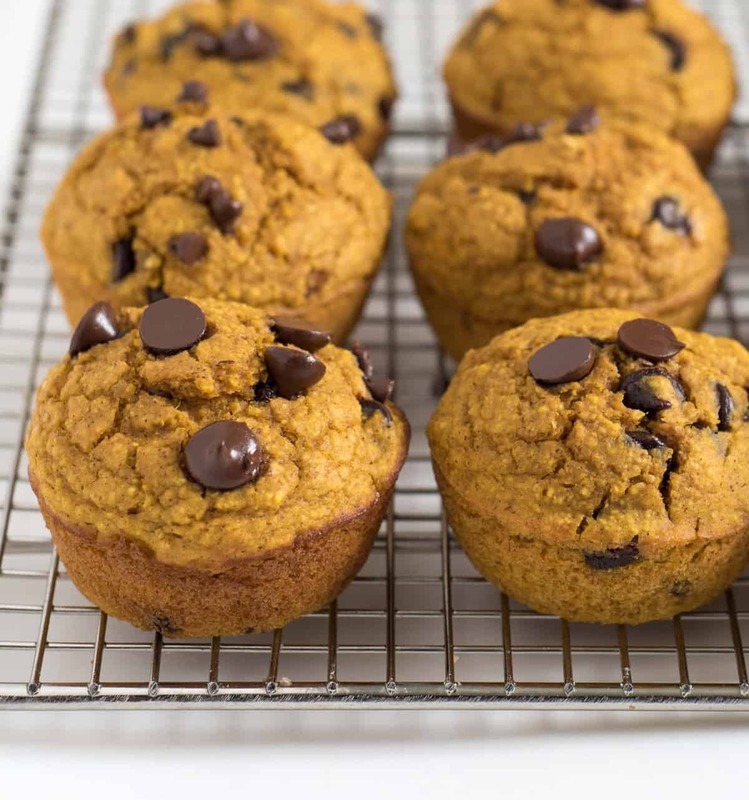 We added good quality chocolate chips because pumpkin muffins and chocolate chips are meant to go together, but you can always leave them out. These are the perfect side dish to eat with eggs in the morning, to stick in your lunch boxes, and to serve alongside soup, stew, and chili all winter long. 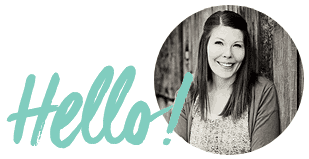 You are going to love them, and your kids will too! This recipe is part of Pumpkin Week that I’m doing with Emily from One Lovely Life. You can check out her Pumpkin Cornbread Muffins here. Long live all the pumpkin muffins! These muffins are sweet without being very sweet. If you are looking for a sweeter muffin, this is not it. That being said, you can exchange the maple syrup for 1/2 cup brown sugar and/or use sweetened vanilla Greek yogurt if you like a sweeter muffin. The chocolate chips are optional though delicious. I highly recommend at least sprinkling a few on top before baking. This recipe is easy to make gluten free, just purchase gluten free oats and read your yogurt label carefully. I used a high powered blender and so my blending time was very short. The goal is to turn the oats into flour and to combine all of the other ingredients. Once those two things have been accomplished, you don’t have to keep blending. These muffins freeze great and will thaw at room temperature in about 45 minutes. Just store them in an air-tight container (these are my favorite) or freezer bag. Add the pumpkin puree, eggs, Greek yogurt, maple syrup, baking powder, baking soda, vanilla, salt, and pumpkin pie spice to the jar of the blender and blend until smooth, 30 seconds to 2 minutes. Add chocolate chips and stir with a spoon or spatula to combine (don’t blend). Pour pumpkin muffin batter into the prepared pans. Top with a few additional chocolate chips if you’d like. This recipe is adapted from Cooking Light. Wasn’t that easy? Make a batch today after school or plan on them for your next meal prep day! 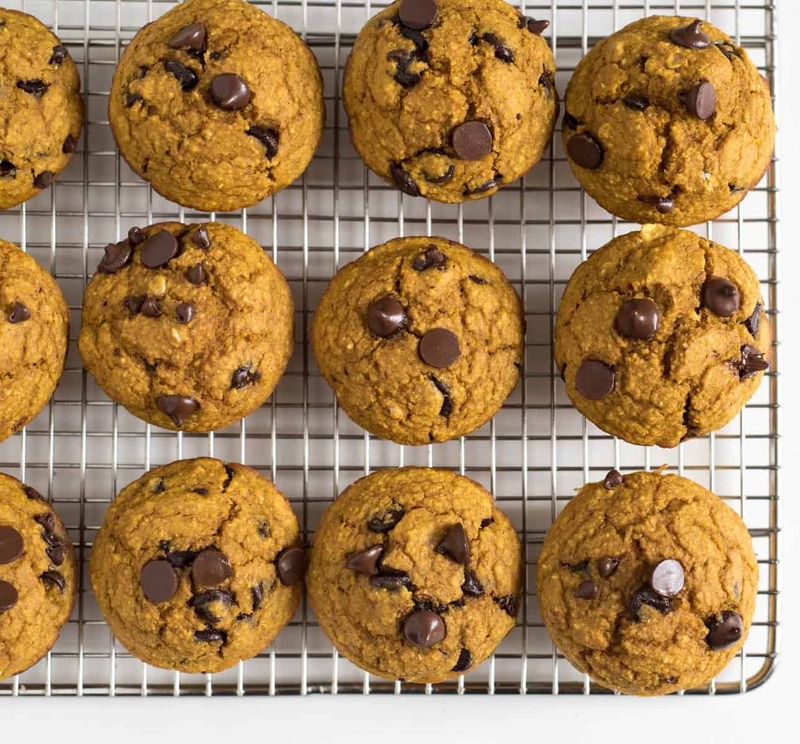 You won’t be sad to have these simple, healthy pumpkin blender muffins on hand all week long. I’m all about making pumpkin recipes right now. This looks so tasty! Plus it’s healthy and you can make it in a blender?! I’m going to save this recipe to try soon. Can I make this in a loaf pan instead? I don’t have a muffin tin. I think that you could though I’m not sure how long you would bake it? It’d start with 45 to 50 minutes and just keep checking with a toothpick to make sure the middle is cooked. If you do, will you let me know so that other people can see in the comments if you were successful. That’s a great idea! I might try it this afternoon! Is there anything that can be replaced with the yogurt to make it dairy free? 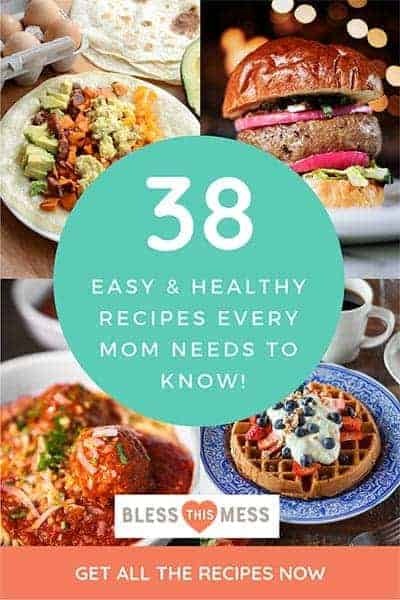 I’d try it with applesauce or dairy free yogurt (we like the So Delicious brand of coconut yogurt if you can find it!). These are amazing! My picky husband and 12-year-old son devoured the first batch last weekend so I’m about to make another batch. I’ve never tried making muffins in a blender before, but I love the simplicity and the results. Thank you! Woohoo! Love it when the family loves what you make! LOVED these muffins! My families been gobbling them up batch after batch the last 2 weeks.. …do you have any other flour/sugar free blender muffin recipes ?! I had a bad experience! After 15 mins the outside was browning and tops were springing back and toothpick inserted inside was mostly clean. I took them out and let them cool and the insides were a mixture of done and raw! 🙁 I was so looking forward to these! I made them to the letter! I’ll have to try again and not change anything and just hope they turn out?! How disappointing, that’s super odd that they would spring back if they were soft in the middle, a raw centered baked good will normally leave a little indent when when you press it because it’s not cooked. Do you know if your oven temperature is off? Sounds like they just needed more time in the oven. These muffins are delicious. I am just wondering why the fat content and calories are so high? They seem really healthy.